Rowenta DW2091 is the same as DW2090 with the addition of Rose Pink Colors. Also same as DW2070 with the addition of Automatic Retractable Cord Reel. 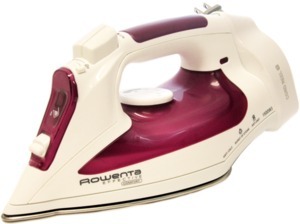 With a striking European design, comfortable thumb rest and retractable cord, this Rowenta Effective Comfort Cord Reel iron provides a wonderful balance of technology and unsurpassed ironing performance. Experience excellent results with this Rowenta iron. 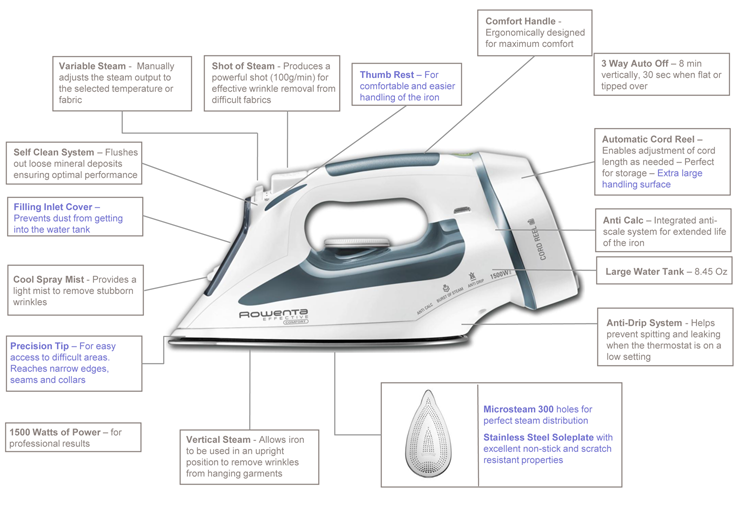 The microsteam stainless steel soleplate has a unique precision tip that provides spectacular ironing results even in the hardest-to-reach areas. Plus, variable steam and burst of steam performance simply melt wrinkles away, and the vertical steam feature allows you to steam hanging garments and window treatments. Press the Automatic Cord Reel button and adjust the cord length to your convenience. Cord retracts completely, for convenient storage storage. and provides a larger handling surface when ironing. 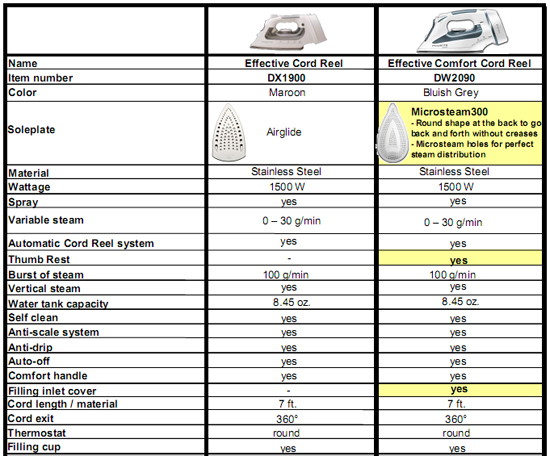 The Effective Comfort Cord Reel iron has the latest design and the outstanding performance features that help make Rowenta the ultimate choice for professional results at home. 6.25"H x 12.25"W x 5.25"D; 3.5-lbs. 3)Open the water tank cover. tap water. If your water is very hard, use a mixture of 50% tap and 50% inexpensive spring or distilled water. Never use 100% distilled water, as it may cause problems for your iron. normal. It indicates the thermostat is working and your soleplate is being maintained at the desired temperature. If the auto-off light blinks, you must disengage the auto-off function. This is done by gently shakingthe iron which will allow the iron to reheat. most sensitive garments first, as the lower (1 dot) settings, then increasing to 2 dots for ironing Silks andWools, and then increasing the heat at the end for heavier fabrics such as Cottons and Linens. No Steam (on the far right) for No Steam for dry ironing, for the perfect finish to your garments, or any degree of steam you want for your fabric. Usually, the heavier fabrics such as cotton and linen require more steam (so you would move the lever further to the right for Max Steam). 8)If you are not familiar with ironing with a Rowenta iron you might want to start with something easy like a pillowcase to practice with the iron and learn all the features that will help you get outstanding resultswith all kinds of fabrics. may use the Cord Rewind button to fully retract the cord. a.We also recommend emptying the iron of water before storing it. Q: I see white flakes coming out of the iron? What are they? few times. This will clear out the flakes and resolve the problem. changed it may take several uses before your iron adjusts to the new mixture and the issue is corrected. Q: Why is there water dripping from the holes in the soleplate? Q: How do I use the Self Clean feature? 1. Unplug the iron and hold it over a sink horizontally. 30 seconds. Shake it gently. You will see steam build up and emerge from the soleplate, rinsing dirt and scale particles out of the steam chamber. 3.Plug in the iron and allow the iron to heat up again to evaporate any water droplets on the soleplate. You may then unplug the iron, allow it cool down, and put it away. Q: I am seeing brown streaks come through the holes in the soleplate and stain the linen? "What water should I use?" The last potential reason is that your linen has not been rinsed sufficiently or you have ironed a new garment before washing it. For best results, always make sure that your laundry is rinsed sufficiently in order to remove any deposits of soap or chemical products on new clothes. Q: Why is my soleplate is dirty or brown? It appears to be staining the linen. You are ironing with an inappropriate temperature selection (temperature too high). starch and you won’t get starch build up on your soleplate. 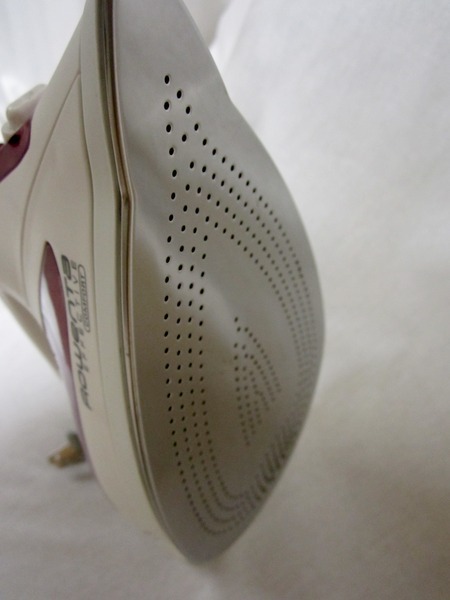 Lastly, you should periodically clean the soleplate using a quality hot iron cleaner. Rowenta offers a hot iron cleaning kit. Q: Why is there little or no steam? The water tank is empty. Fill the water tank. Another cause is using your iron in dry mode for too long. In this case, carry out a self clean. or ironed over a zipper. Always set your iron on its heel. Do not iron over zippers or buttons that may scratch the soleplate. Q: Why is steam or water coming from the iron as you finish filling the tank? The steam control is not set to the steamposition. Check that the steam control is set to the position. The water tank is overfilled. Never exceed the Max level. Q: Why does the indicator light keep going off and on? There are actually two lights on the iron. The Auto Off light, in front of the handle, will begin to turn on if the Auto Off safety feature is activated. This happens if the iron is left on its soleplate or on its side, without movement, for 30 seconds, or if the iron is left on its base without movement for 8 minutes. If this light turns on, simply move the iron to temporarily disengage the Auto Off feature. Great product, great price, great service. Thanks! I have been shopping from Allbrands for several years, and never have I been disappointed!